I was invited to a local screening of Living In The Age Of Airplanes at the Udvar-Hazy Center Air and Space Museum in Chantilly, Virginia. All thoughts are my own. screening on my calendar for Wednesday, August 26, I didn’t realize how profound the timing was going to be. I had just flown back home to the DC area on Sunday night after spending 8 days in Utah with my mom, dad, daughter, and sister. Like many other Americans, especially those of us that travel regularly for work or to visit family across the country, I take air travel for granted…and like the majority, I probably complain about it every now and then. Delayed flights….crowded terminals….horrible snack choices…..lost luggage. Just 2 weeks before I left for my latest flight to Utah, I arrived back home from my family’s 27-day cross country road trip, where we spent a week and a half at my parents’ house. On that first trip, we drove 6500 miles. We were on the road for days and days to get to our destinations. And yet, just a handful of days later, I made the same trip in under 5 hours. It’s amazing, really, what we’ve accomplished in the last 100+ years. The airplane has connected us in ways that our great grandparents couldn’t have even imagined. Living In The Age Of Airplanes is not a movie about how airplanes work. Living In The Age Of Airplanes is a movie about US. About our culture. About how the airplane has shaped and driven our current culture, and how it has connected the world in a way that was not possible – not even fathomable – just a century ago. It changed my perspective about the way we travel…the opportunities we have…the products we use…the way we interact and do business. And yet as profound of an experience as it was for me, it was also thoroughly entertaining for my kids. The cinematography is breathtaking. The stories are engaging. At just under an hour long, it is a perfect amount of time for a family with varying ages. As we walked away from the theater last week, my 2 boys immediately started talking about some of the things they had seen in the movie. It made them think. It was engaging, entertaining, educational and thought-provoking. And I can’t recommend it enough. Living in the Age of Airplanes — Trailer #1from Living in the Age of Airplanes on Vimeo. FILMED IN 18 COUNTRIES, ACROSS ALL 7 CONTINENTS! Yes, the airplane has changed our world, but do we really understand exactly how much? LIVING IN THE AGE OF AIRPLANES renews our appreciation for this amazing invention as it stunningly conveys the wonder and grandeur of flying. Not that long ago, traveling between continents was a migration. Now, on any given day, 100,000 flights transport people and products between any two points on Earth in a matter of hours. Indeed, the airplane may be the closest thing we have to a time machine. Filmed in 18 countries across all 7 continents, the film explores the countless ways the airplane affects our lives (even when we don’t fly). 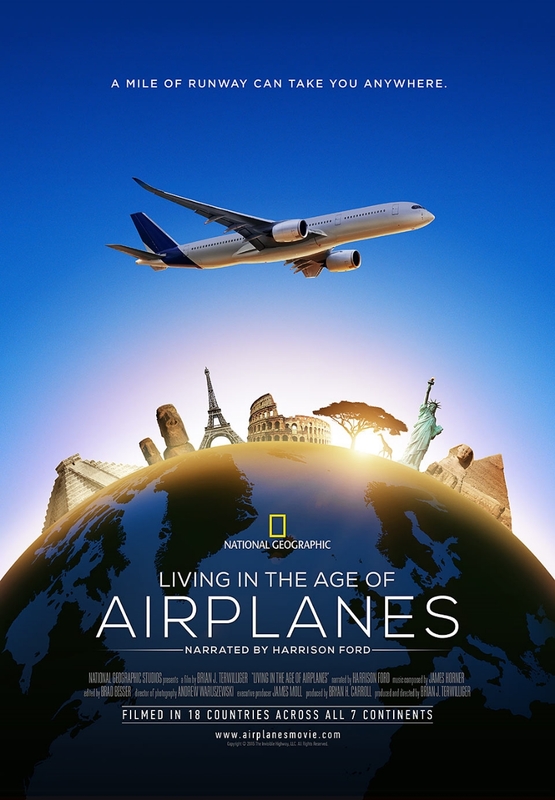 With a fascinating take on history, breathtaking visuals, soaring music, and a truly unique perspective, LIVING IN THE AGE OF AIRPLANES shows the airplane in a fresh light as it takes audiences on a wondrous trip around the globe. LIVING IN THE AGE OF AIRPLANES is narrated by Harrison Ford, produced and directed by Brian J. Terwilliger (One Six Right), and features an original score by Academy Award® winning composer James Horner (Avatar, Titanic). Living In The Age Of Airplanes is showing in select theaters across the country, with new venues being added regularly. See if it’s showing near you! Win a Family 4-Pack of Tickets to See Living In The Age Of Airplanes! Enter on the giveaway widget below for a chance to win these tickets! Giveaway ends on September 10, 2015 at 11:59 pm ET. Good luck! After the giveaway ends, a winner will be chosen at random and notified via email. You choose when you see the movie! Please remember that these tickets are for the 2 DC-area locations listed above, so please enter if you are within driving distance or you have plans to visit the DC area soon. Thanks! NOTE: I’ve lost several of the comments on my blog due to a server issue. All entries are valid, regardless of comments that were lost. Thanks!